As protected bike lanes have spread, so has a new problem: how to keep protected bike lanes clean. Traditional sidewalk sweepers are often narrower than needed for this job. Conventional street sweepers don’t fit between curb and barrier. And though there’s a wide array of industrial sweepers on the market, machines designed for indoor use have hoppers that fill up too quickly. That said, if you ask around for long enough, you will find a few sweepers that fit the separated bike lane niche. Building on a directory started by Austin engineer Nathan Wilkes, here’s what we’ve found. Used by Montreal, this product formerly known as the CN100 is among the smallest and narrowest sweepers in its class. It only needs four feet of clearance at a bikeway pinch-point, but can extend its brushes more than seven feet. The narrow vacuum head and sweeper underneath the body mean that it’s best suited to bike lanes protected from road debris by curbs. Used by San Francisco, the CN201 sweeper has the widest operating-width range of any sweeper we could find, capable of squeezing its body into less than five feet and stretching to more than 10. Its “optimum sweeping width,” however, is 7.5 feet. Another machine that’s better suited to curb-protected lanes than post-protected ones. Used by Portland, the Ravo 5 needs almost 8 feet of clearance but has almost the largest-capacity debris hopper in its class. Hopper capacity: 4.65 cubic yards for the R4, 6.12 for the R6. The S4 has a 4-yard hopper that’s equivalent to a 6-yard regenerative air alternative. Leased by Chicago for $5,000 per week, the S4 (pictured) is another sweeper on the large, wide side of the spectrum. The R4 and R6 are bigger still. All three can travel at highway speeds to and from worksites. The rear broom can “handle miles and miles of heavy debris” without clogging, said Mike Amsden of the Chicago Department of Transportation. The A4 Storm has a fairly large body and a massive suction head. Like the Starfire, its big suction head and rear broom suit it to debris-laden streets. Tennant is one of the big North American brands in the industrial sweeper business, and the Sentinel is their largest product. A relatively narrow wheelbase and four-wheel drive makes it unusually maneouverable. The narrowest of all the street sweepers in this directory by one inch, the 636 has a slightly larger hopper and slightly higher top speed than its closest peer, the LS100. This is another that works best in relatively low-debris situations like curb-protected lanes. 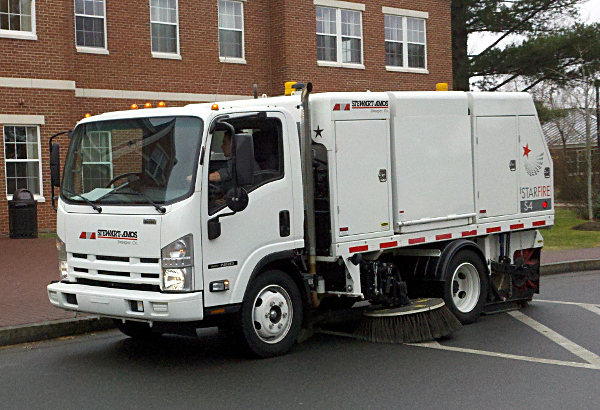 Have you seen other makes or models of street sweepers in action keeping bike lanes clear? Let me know: [email protected] We’ll add it to this list.